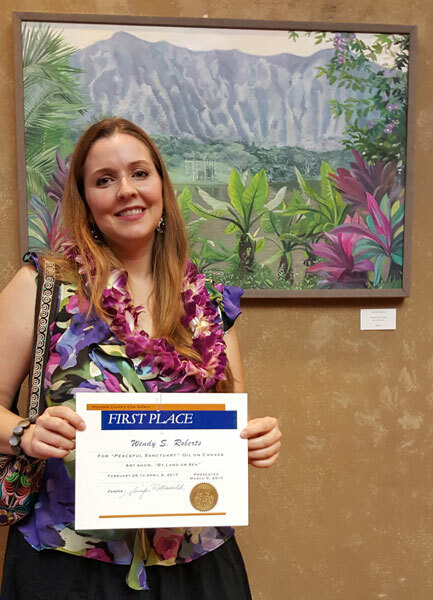 I am excited to announce that I unintentionally dressed in the same color scheme as my painting, and also, “Peaceful Sanctuary” won first place at the HCC “By Land or Sea” show yesterday! Hooray! It was nice to see friends and meet so many wonderful people at the reception! Thank you Jennifer Rothschild for organizing so many lovely shows at HCC, and also to the three anonymous (mysterious) jurors who chose my work. It’s an honor and I am grateful! Standing in front of my painting, “Peaceful Sanctuary” in my coordinating outfit. I wish I could say I planned it, but it was just a happy fashion accident.